Deprecated posts are where I revisit popular posts I made on other sites. Depending on the amount of time that’s passed, some of what is written may no longer be relevant, but I believe much of what is covered in these posts is still worthy of discussion. Now that Google has officially released Android Wear devices (and my Pebble may not be long for this world), I figured it’d be appropriate to share 13 Days with the Pebble Smartwatch, which is both a review of the Pebble hardware but also a defense of the smartwatch as a useful concept. The following was originally posted on The Verge’s forums on August 8th, 2013. 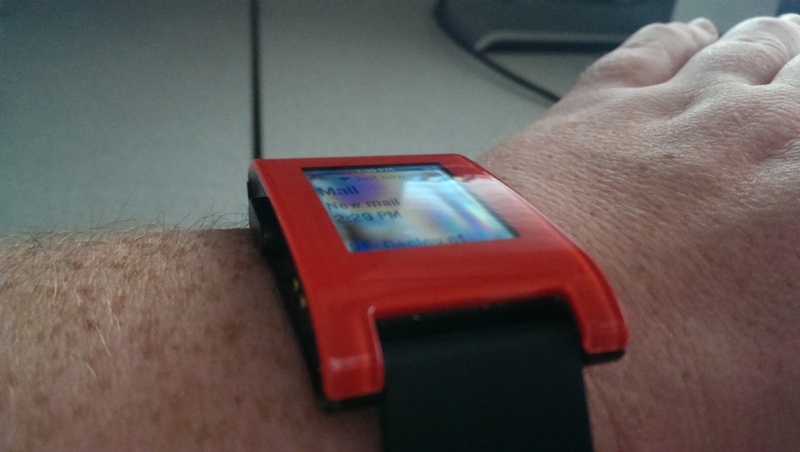 The Pebble Smartwatch is very much a first-world solution to first-world problems. It’s a device that’s almost entirely about small conveniences, rather than big, world-changing ideas, and I think that’s fine. Not every smart device needs to change the world – and enough small conveniences in a single package can add up to something special. I’m not even entirely sure why I bought one, to be honest. I was always a bit upset that I missed out on the initial Kickstarter campaign, so went to Best Buy a couple of times and asked about them. Each time, the salespeople basically laughed me away each time – not maliciously, but simply because they rarely got shipments of more than a couple in at a time, so getting one was almost impossible. Logically, because it was impossible to get one, I had to have one. As luck would have it, thirteen days ago I found myself in Best Buy picking up a Chromecast, when, almost-entirely-facetiously, I asked if they had any Pebbles in, too. He went to check, while I racked my brain (and quickly looked up reviews on my phone) to decide if I really needed this thing. By the time he returned, and confirmed that the Pebble was mine if I wanted it, I’d decided. I double-checked the return policy (fourteen days) before leaving, just in case I decided the added convenience wasn’t worth the cost. So the question I’m answering now, thirteen days later, is: am I keeping this thing? As usual, I’ll give you the tl;dr first: Yes, I’m keeping it – read on for why. People often ask me what the Pebble does, and my answer – “send notifications from my phone to my watch” – and that’s true; at its core, the Pebble is simply a notification triage device. Sure, it can do more if you want it to and put the effort in, but notification triage is undoubtedly its primary function. Admittedly, that doesn’t sound terribly impressive or game-changing. There’s certainly more cool stuff I can do with it, and I’ll get to that later, but even that basic functionality has enriched my life in noticeable and, at times even surprising, ways. First, a confession: I check my phone too damn much. It’s part nervous tick, and part Notification Anxiety (a term I just invented that means fear of missing an important notification –did I mention this is a first world problem? ), but it’s also simply rude. One of Motorola’s big lines when announcing the Moto X is that people check their phones an average of 60 times a day, just to get the time and look for missed messages, and I can totally believe that. The Active Notifications feature in particular was made to solve the problem of people hitting the power button on their phones up to 100 times a day just to glance at the time and or notifications — something I know a lot about. The Pebble has, more or less, solved this same problem for me, but in a way that isn’t tied to any specific phone. You might argue that I’m treating the symptom and not the cause, and you wouldn’t be wrong – but even so, it still helps. My phone comes out much less now – only when I need to actually do something with it – and I think that’s a great thing. I’ve heard the argument made that glancing at your wrist is just as rude as pulling your phone out to check on it – the person you’re talking to might assume you’re bored and checking the time – but I’ve not found that to be the case. For me, the value comes from the slight vibration on your wrist, which comes with the knowledge that I definitely have a notification. That way, even if I can’t check my watch right away, I’ll know that when I pull my phone out, I’ll have something to look at – as opposed to pulling it out just because. It sounds silly, and perhaps it is, but I’ve found it makes a big difference in how I use my phone. There’s also a certain beauty in receiving a notification, even when your phone is otherwise on silent. I’m also, happily, no longer one of those people that puts their phone on the table while eating and constantly glances over to see if I have any notifications. There’s also the added convenience that comes with being able to glance at notifications in situations that otherwise wouldn’t be possible – when you’re carrying things or when driving, for example. ...and it's awesome to see notifications right on my wrist as I'm driving. Obviously, first world solutions to first world problems, but hey, useful is useful. Speaking of useful – notification triage may be the Pebble’s primary purpose, but I’ve found a few others so far. Beyond forwarding of notifications, I have found several other uses for the Pebble, though they vary in their degree of, well, usefulness. It’s important to note that I only have experience using the Pebble with an Android phone – the HTC One in particular – so I can’t really speak for how the experience is on an iPhone. Pebble Notifier is perhaps the single-most-useful Android app for Pebble, as it allows you to send all notifications from your phone to the Pebble. You can define exactly what you want to send notifications, and exactly what don’t want to send notifications. It increases the functionality and power of Pebble several times over. 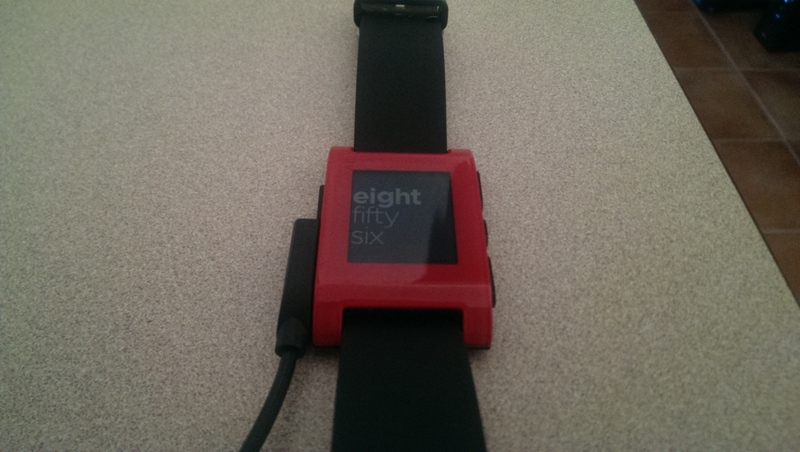 Glance for Pebble is another tool that, even though it’s still in beta, makes Pebble substantially more useful. It’s essentially an app you run in place of a watch face that gives you time, weather, and date information – but also gives you views of your calendars, and allows you to perform basic functions on your phone, such as sending pre-defined SMS messages and executing up to three Tasker functions. So far I’ve set up Tasker to toggle WiFi, turn on Google Now (very useful), and bring up the Recent App list. Setting up these Tasker tasks isn’t as easy as I’d like, and it’d be great to see this functionality supported more-directly by the Pebble API. 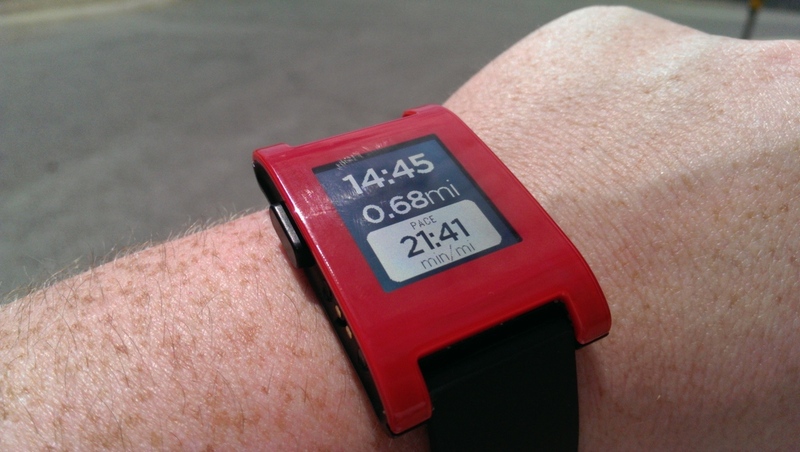 Stopwatch and Timer are Pebble apps that…do exactly what you’d expect. Pebble Phone Ringer Switcher is another app that does exactly what you’d expect – it lets me toggle my phone’s sound profiles between Normal, Vibrate, and Silent. Surprisingly useful. Pebble Locker is similar to Trusted Devices on the Moto X – basically, when my Pebble is connected, there’s no PIN lock on my phone. As soon as my Pebble is disconnected, the phone locks itself and enables the PIN lock. 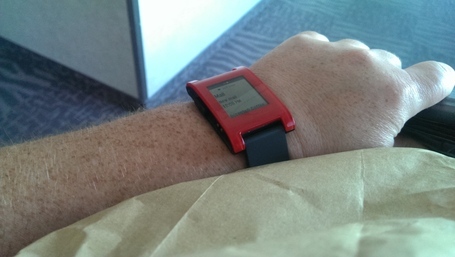 Reconnecting the Pebble will once again disable the PIN lock. This is a nice way of adding convenience without sacrificing security. Pebble Rocker is a great little app, mentioned in the comments by drewstiff. It lets me check in on Foursquare from my watch (something I’d actually been actively looking for), take a picture with my phone from my watch, and “ping” my phone if it’s somewhere nearby, amongst a ton of other things I’m not actually using yet, like Facebook and Twitter browsing. The only issue I see is that Pebble can only hold a limited number of Watch Apps, and a lot of these are bundled separately, so you may have to choose what is most important to you. RunKeeper ties into the Pebble to display Time, Distance, and Pace information – nothing ground-breaking, but definitely a nice-to-have for someone like me who has used RunKeeper for years. I have, of course, installed a few silly watch faces, like Mario and Star Trek-inspired LCARS, but generally, I use the default watch face, as I like the style and font. It’s always nice to have options, though. I use the music controls more than I thought I would, mostly in the car to play/pause music and podcasts on the stereo, as my watch is generally closer, more convenient, and (surprisingly) more-reliable than the built-in stereo controls. It’s also easier to use without taking my eyes off the road – whether by providence or by design, when you leave the watch face, the first option is “Music”, so touching the same button three times will start or pause the radio. By default, you have to choose a single music app that Pebble controls, but I’ve installed a third-party app called Music Boss for Pebble that allows me to toggle between Google Play Music and the standard Music app by double-pressing the play/pause button. Quite handy. The argument could be made that, between music controls and notification triage, the car is one of the most useful places for a Pebble – no more digging my phone out at a red light to see who sent me a message, or to see if that e-mail from work is something important. Fortunately, the Bluetooth connection from my phone to the Pebble does not appear to interfere with the Bluetooth connection from my phone to my car stereo. Not directly related to any specific feature, but an unexpected convenience I discovered – the Pebble is great for two-step authentication with my credit union, as you can just glance at your wrist to get the login code. It’s also incredibly convenient to get my Google Now reminders directly on my wrist, as for some unknown psychological reason, it makes me more likely to do whatever task I’ve set for myself. Direct Google Now integration. It’s cool that I can launch it with Tasker, but it’d be even better if it was somehow a native feature. Notification Sync. Getting notifications on my wrist is great, but I wish there was some way to mark the corresponding notification as “viewed” on my phone. A better included watch strap would be nice. I might get something like this, eventually. Better Pebble apps for viewing my calendar and viewing the weather forecast would be awesome. So, that’s what it does (and doesn’t) do – but how about the device itself? Is it any good? I’m not going to linger on the hardware of the Pebble too much, as I could really just say “good enough”, and call it a day. The display is good enough – it has an inky/oily view in certain, rare lighting conditions and from certain angles, but it’s clearly viewable in bright daylight, and the backlight works well enough to make the screen visible. My biggest complaint is that the glass on the display itself is beginning to scratch after only a couple of weeks, so I can’t imagine how it will look in a year. The oily screen looks kind-of gross, but doesn't happen often, and doesn't impact usability all that much. Several people have asked me if the red faceplate is interchangeable and, sadly, the answer is no. 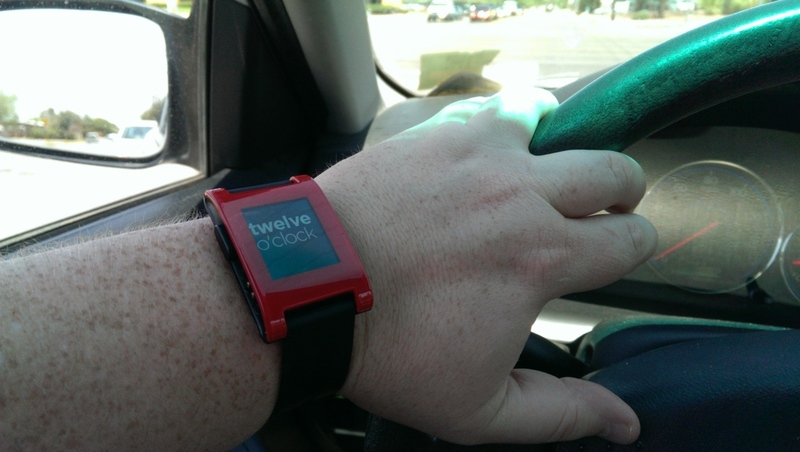 Given its tendency to scratch, and the fickle nature of many consumers (myself included), I think it would be a great addition for the next version – and hey, from a business perspective, it’s another way for Pebble to make money. The buttons are good enough – they felt a little cheap at first, but they work reliably. The interface is good enough for now – I would say it’s a bit like the classic iPod’s interface – simple and effective, but it feels like the form factor is waiting for a UX revamp akin to the first time we saw the iPhone’s interface. Installing new watch faces and new apps is good enough – it’s not the most intuitive experience, but I haven’t had much trouble. For the most part, stuff Just Works(tm). Until recently, there were some accessibility bugs on the HTC One that caused issues with the lock screen when the Pebble was active, but this appears to have been resolved with a recent OTA from HTC. Originally, I thought the OTA was just an update to carrier settings, so the fact it fixed the accessibility bug was a nice surprise. Battery life is also good enough – it’ll last for 4-6 days, in my experience, but I’m the kind-of person who charges all of my devices every night anyway. My annoyance that the charger is proprietary is balanced by the convenience of the fact it’s magnetic. I just put the charger in the same place I leave my keys and wallet every day, and the watch is always ready to go in the morning. The alarm function is…mostly useless. It vibrates 20 times, which is a hilariously inept way of convincing me to get out of bed. I have enough trouble with an alarm I can reach from my bed, much less a slight vibration I can just ignore. The one time I tried to use it, I’m pretty sure I fell back asleep before it stopped vibrating. Beyond that, there are some things I’d still like to see added. A microphone, to help with dictation and reminders, would be great, especially considering you can use the Pebble in the shower – I don’t know about you guys, but many of my great ideas are born and die in the shower, as I currently have no way of recording them as they occur to me – a Pebble with a microphone could change that. A friend asked me if I thought the Pebble was the device that would “bring back the watch” – my answer was quite simply “no”. It’s not that it’s not good enough of a product (that’s a different debate), but rather than it only serves a particular subset of the population. It’s definitely something that appeals exclusively to nerds – and even then, it’s a subset of nerds that it appeals to. For now, though, it’s too expensive and too niche. However, what surprised me is that my time with Pebble has shown me ways it was useful that even I didn’t predict, and when the right smartwatch comes along, it might just have the same mainstream acceptance and market-transforming impact that the original iPhone and iPad did. It will take the right convergence of design, price, marketing, and easy-to-use features – and it may also take the right phone combined with the right watch. I think the Moto X, for example, paired with a Google smartwatch, could be a game-changer. 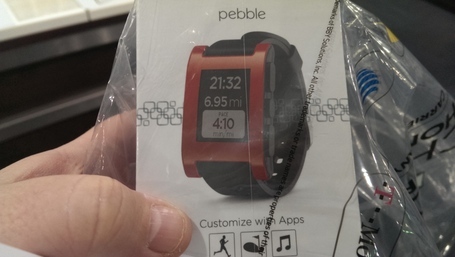 I imagine owning a Pebble is much like how owning the first-generation iPhone must have felt. That’s not to say that the Pebble should be compared to the iPhone – the smartwatch “revolution”, if and when it occurs, can never have the same impact as the smartphone revolution, and the Pebble is simply not on the same level as the iPhone, design or build quality-wise. Smartphones improve most people’s lives in obvious ways, while smartwatches are – by their very nature – a luxury that will serve a niche subset of that. But, there are notable similarities – the Pebble, like the original iPhone, is an overpriced device with obvious, obvious flaws and missing features that have to be fixed in the next generation – but the core concept of a companion device is solid and hints at greatness just around the corner. I don’t know if it will be Pebble, Microsoft, Google, Apple, or someone else entirely who finally nails it, but I’m more confident than ever that someone will nail it – and that it will happen soon. The Pebble, in its current form, isn’t that device – but for now, and for me, it’s a great placeholder – it’s a bookmark on my wrist, holding down the fort until a real revolution comes along. I recognize that it’s definitely not a device for everyone, and honestly, perhaps not even a device I’d recommend to many people. Most people think it’s silly and useless, and for them, they’re probably right. Some people still think smartphones are silly and useless, and again, for theirlives, they may very well be right. Really, though, that’s kind-of what being a tech fan is about – finding the devices that fit our lives – and I’ve found, based on how I live my life and use my devices, that the Pebble is a great companion, and makes my life just a bit more pleasant.